On International Women’s Day 2018, we’re highlighting the role that women often play in feeding their families and the importance of making sure that the kitchen is an open space, regardless of gender and age. “Girls must learn to cook and this kitchen is your territory,” said my mother ages ago. Being a lousy cook myself, I’m lucky that my father is actually the one who makes breakfast every morning and who often cooks for the entire family! But here in Indonesia, the notion of the kitchen as “women’s turf” is still widespread. Meals cooked by “our mothers” (in our kitchens at home) are idolised for being superior in taste, and evoke intense nostalgia – smells from your childhood, and so on. Despite the many male celebrity chefs on TV, when it comes to our own kitchens, women are expected to be the cooks and the ones responsible for ensuring our food is healthy and nutritious. Even the female chefs featured on television are filmed in their homes or on a set that looks like their own kitchens. In other words, society perceives that men are chefs and women are cooks – a dangerous stereotype – and feels that the responsibility for feeding families healthy, nutritious and tasty meals falls to the latter. In urban areas in Indonesia, it is not only the mothers who bear this burden, but also domestic paid caregivers (DPCs), who are predominantly females. And as more women enter the workforce, they have less time to prepare food at home. Many working mothers rely on DPCs to look after their children, and this often includes cooking for the children themselves. In a study by Roshita, Schubert, and Whittaker[i], almost no Indonesian mother thought the father’s role in the family included child care and domestic tasks – including cooking. This finding also shows why domestic tasks in wealthier households are outsourced to a female domestic paid worker, rather than being done by the fathers. But in this day and age, women need to be free from societal constraints that relegate them to the home, and the entire family – fathers and children included – should share responsibility for ensuring the family’s well-being at home. Men ought to feel welcome to contribute and share the burden, and stove-top decision-making must become both parent’s responsibility. To achieve this, proper education for boys from a young age is crucial. 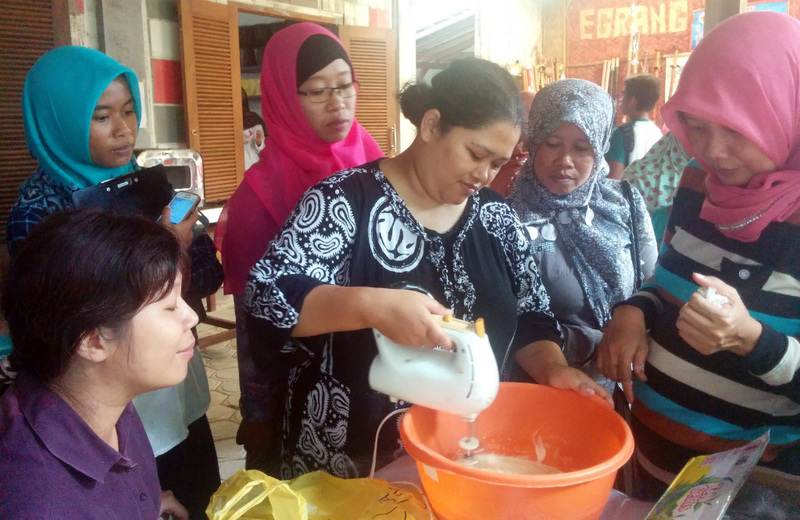 One of Hivos’ Indonesian partners in our Sustainable Diets for All programme, Tanoker Foundation in Jember Regency, East Java, specifically includes boys from elementary school level in their healthy cooking classes and campaigns. Here, with their female friends, the boys learn how to prepare and cook healthy, nutritious and tasty food using locally-sourced products. From cutting the vegetables to scraping coconuts and stirring the pots, these boys get to experience – and enjoy – what their mothers do in the kitchen. Hopefully they will grow up to become fathers that will head for the kitchen instead of shying away. So the kitchen should be an open space for everyone, regardless of gender and age. And the more healthy, home-cooked meals a household is able to produce, the less unhealthy highly-processed, convenience foods the family will consume. Sustainable Diets for All (SD4ALL) is a Hivos and IIED advocacy programme that uses evidence, including evidence generated by citizens, to help low- income communities in Zambia, Uganda, Indonesia and Bolivia improve their access to sustainable, diverse and nutritious food.